Do you want to schedule a playlist to run overnight? Do you have a presentation or message you need to play past midnight? For example, maybe you can play static messages only from 7 p.m. to 5 a.m. due to a city ordinance. If you have a situation like this, you came to the right place! On the Date and Time tab, set the date range you would like the playlist to run. Set the Start Time to your desired start time. Set the End Time to 11:59:59 PM. Click the Recurrence tab, select Weekly, and choose the days of the week you want. This time, set the Start Time to 12:00:00 AM and set the End Time to your desired end time. Click the Recurrence tab, select Weekly, and choose the days of week you want again. Now you know how to schedule overnight! 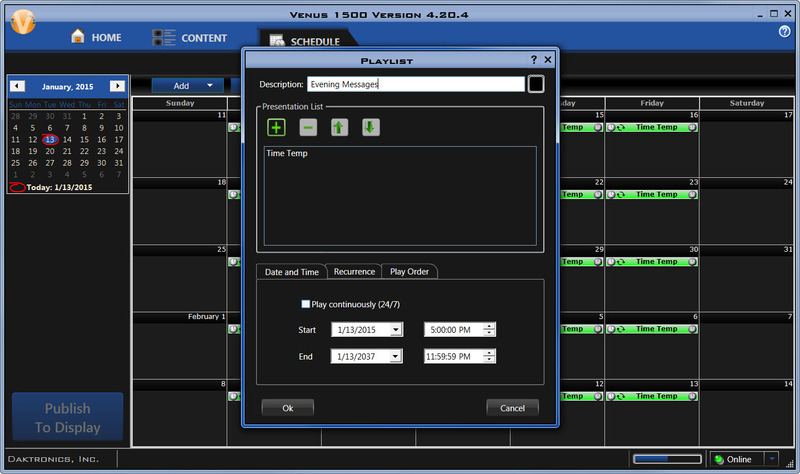 For more detailed, step-by-step instructions, please view our Knowledge Base: How to schedule overnight, make display blank at night, or create dayparting playlists in Venus 1500 V4. Be sure to check back next week for the final entry in our Scheduling Tips series. Thanks again!! !